SEA BEE 15 is the logical choice for those who want high planing speeds with maximum stability and good sail carrying capacity. The huge cockpit about 10 ft. long, means she can carry four to five in comfort and safety. 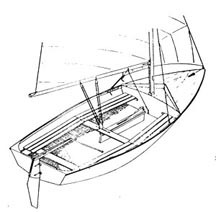 She is of hard chine constructions and features a watertight double bottom for buoyancy.she is light enough for lifting by two men. The mast is 22 ft. long stepped on the foredeck. 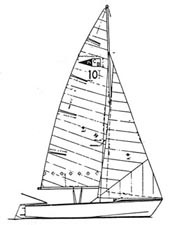 There is no design of this size which offers so much, both as a racer or large family boat. Step by Step Instructions. COCKPIT SIZE 5' 8" X 9'10"